It’s no secret that around here life is rolling with fervor. I’m keeping up – which lets me know I’m right where God wants me to be. Tending all the little and big things each day, considering and anticipating what I can, and leaving just enough margin for those things I can’t anticipate. I’m not sure life has ever been this full for us, and yet, I am grateful for extraordinary peace. This is where I am. I have always loved planning. For as long as I can remember I’ve been drawn to pretty stationery, papers, and pens, and using those tools as a landing space for ideas, thoughts, plans, and creativity. Planning allows me to see on paper – where I am, where I’ve been, and where I’m going. I think everyone probably has a different planning style – so this isn’t a one-size-fits-all post or a plan-like-this-or-you’re-not-a-good-planner message! In the planner world, planners call it “planner peace,” but I’d probably just say that I use tools that fit me and my family and I’m content right there. Just as my home bends and flexes to meet the needs of the people in it, my planner and planning style must bend and flex, too – because it exists for the people in this home and the people I love. I’d like to share a few different kinds of planning tools and formats and show how each has been working for me, and then I’ll share the tool I’m working in with the most productivity lately. 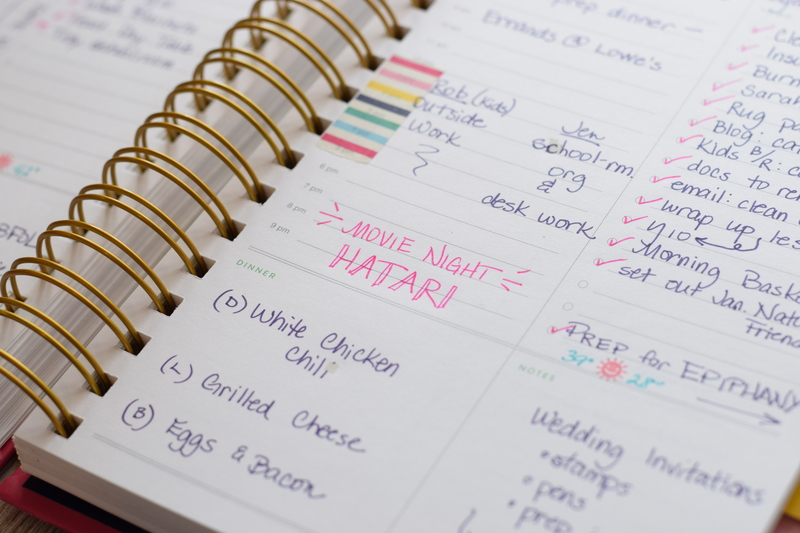 Whether you list it out in a plain spiral notebook, or digitally in a productivity app (my favorite is Cozi! 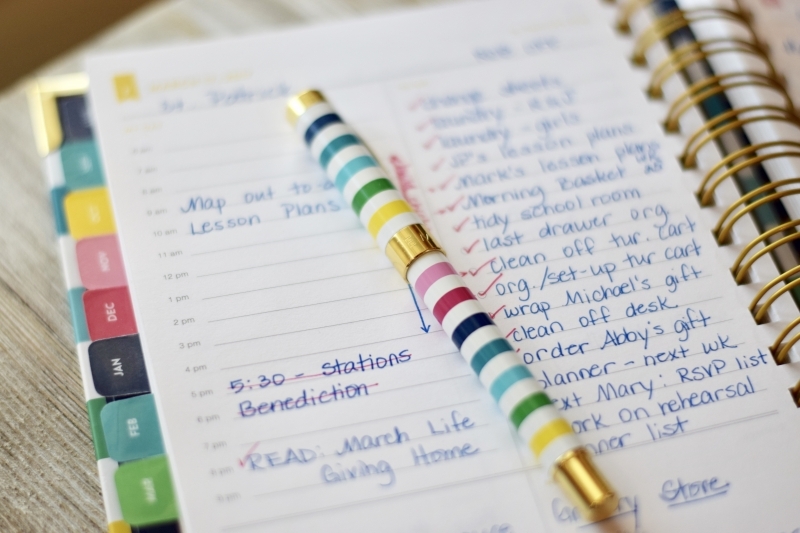 ), or in a paper planner tool, planning is a way of making sense of the tasks, goals, and lists and keeping them organized. So let’s walk this through the different planner formats out there (formats – not styles! Styles – now that would be a different post entirely!). 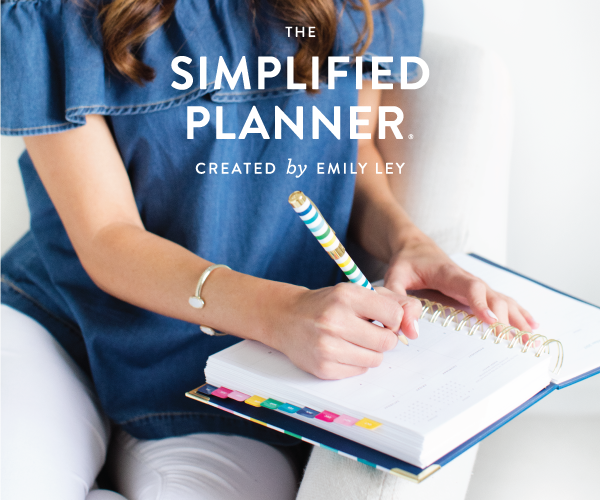 I have two popular brands – the Erin Condren Life Planner, the Erin Condren Deluxe Monthly Planner, and the Emily Ley Simplified Planner. We’ll start with the big picture planners – the monthly – and work our way into the more detailed weekly and then super detailed daily. Let’s go! I’m a long-time fan of Erin Condren planners. Erin Condren makes a fantastic planner – thoughtful, customizable, and beautiful! I’m a fan! Erin Condren planners have been springboarding my day for the last four years. 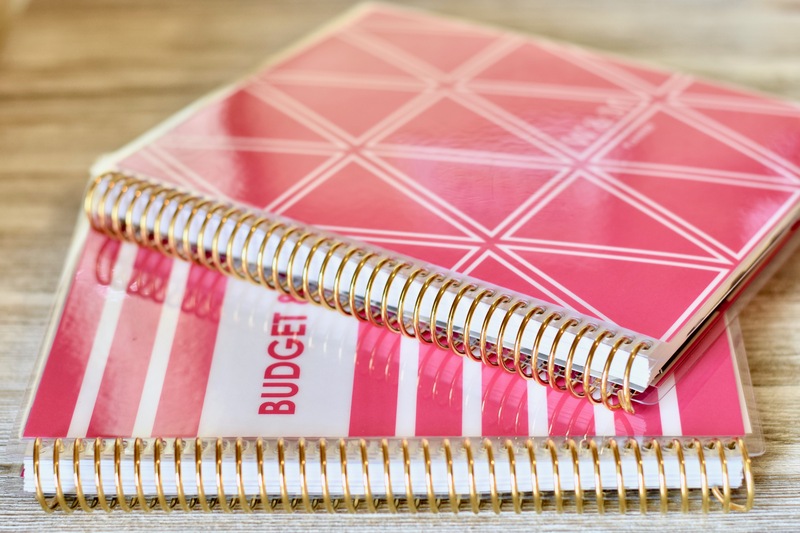 This year, I’m using an Erin Condren Deluxe Monthly planner to coordinate some of my goals that easily break out into their own planner – one planner for writing and (social media/blog) sharing goals, and another planner for my budget and finance goals. I absolutely love this planner! 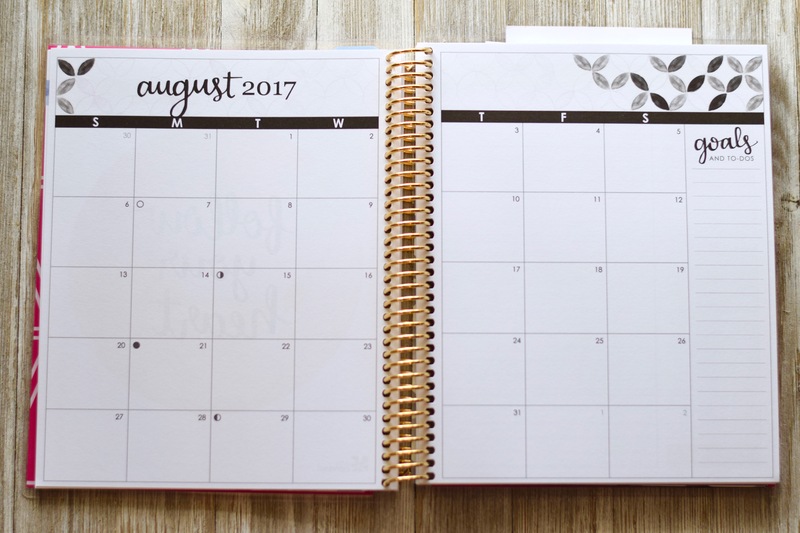 If you like a really big picture of your month and a place to jot a few planning maps, goals, or just a spot to write down your monthly vision – then a monthly planner may fit your needs well! Or if you have a particular aspect of your life that you’d like to really focus on – through goals, lists and plans – this deluxe monthly may be a great tool and a good fit. Perhaps a prayer journal, daily virtue goals and gratitude journal, budget planner, health and fitness journal? One thing I particularly love about this monthly planner are the pages that follow each simple monthly layout. These pages allow you to identify special areas of focus, or perhaps you’d use them as a place to organize listing. Either way, I find the format useful! 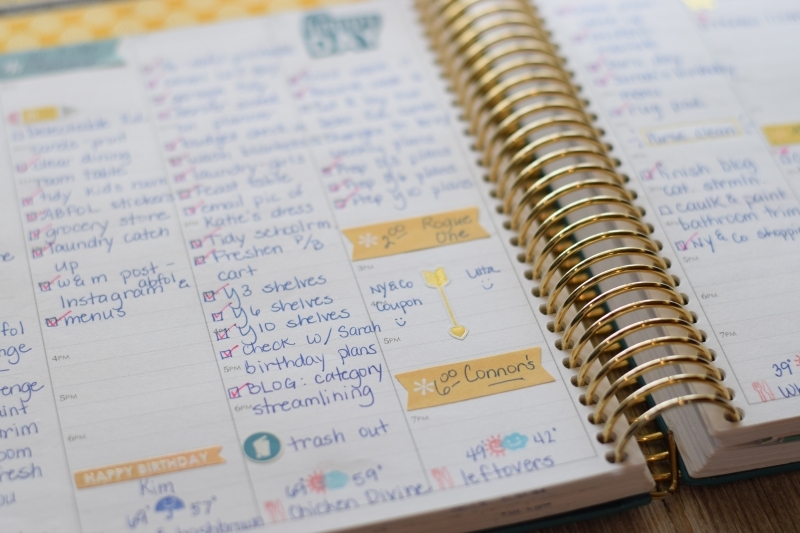 A step toward more detail moves you to a weekly planner. 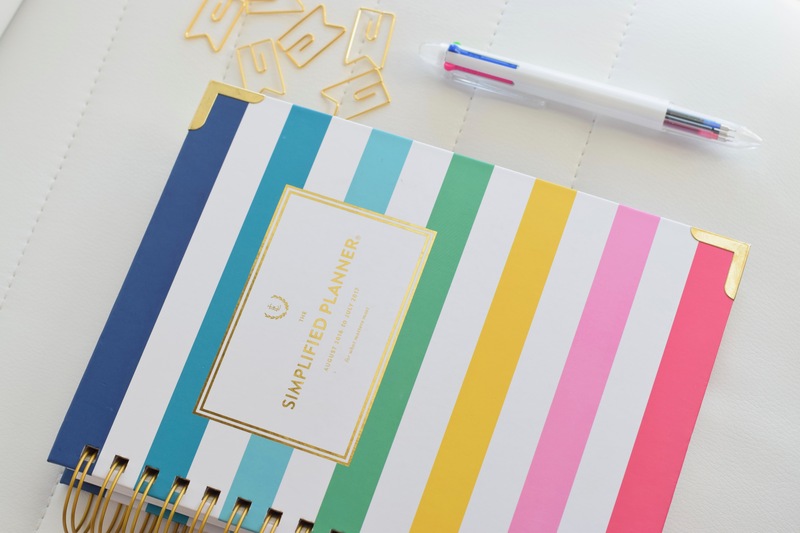 The Erin Condren Life Planner is hands down, my favorite weekly planner. (Read my 2017 review post with video here) Offering a myriad of customizable options (layout, color, cover, coil color), you can build a weekly planner to fit your style, personality, and planning dreams! Do you envision something colorful and fun? You can build it! 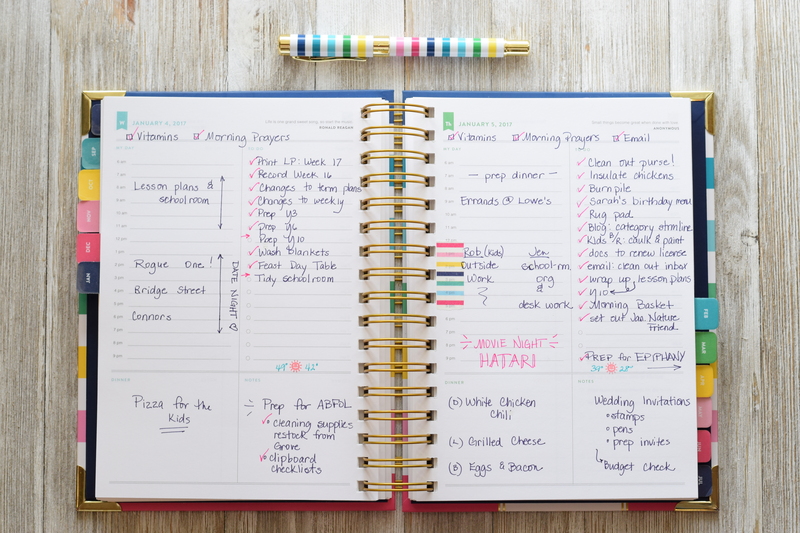 Or maybe you’d like a weekly planner that’s more sophisticated – you can build that, too. And the different layouts – hourly, horizontal, or vertical – add another dimension to the usefulness of this planning tool! 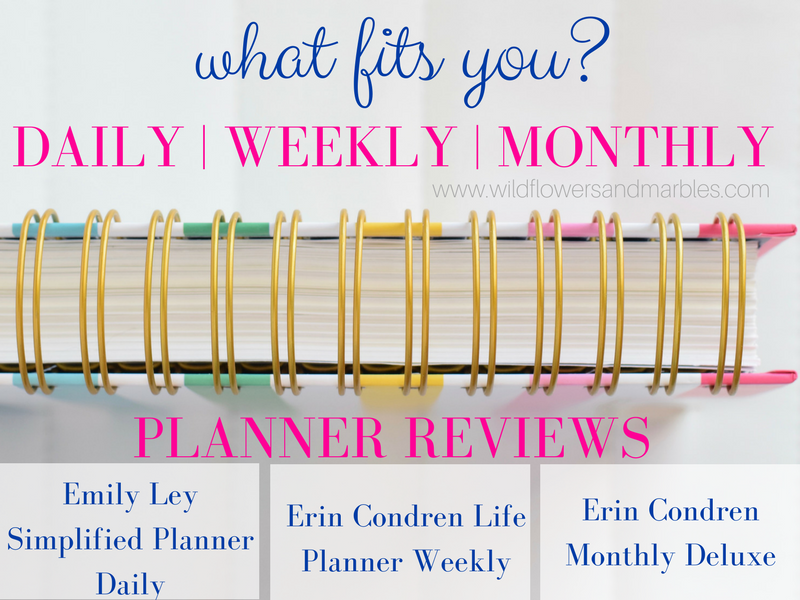 The Erin Condren Life Planner in the weekly format has been my home for four years now. For a look at how I plan, you can check out this index of planning posts, but it’s always the same – I start with the big picture and my month, spend each Sunday considering the week upcoming, and then check in and add goals daily. Month–>week–>day. 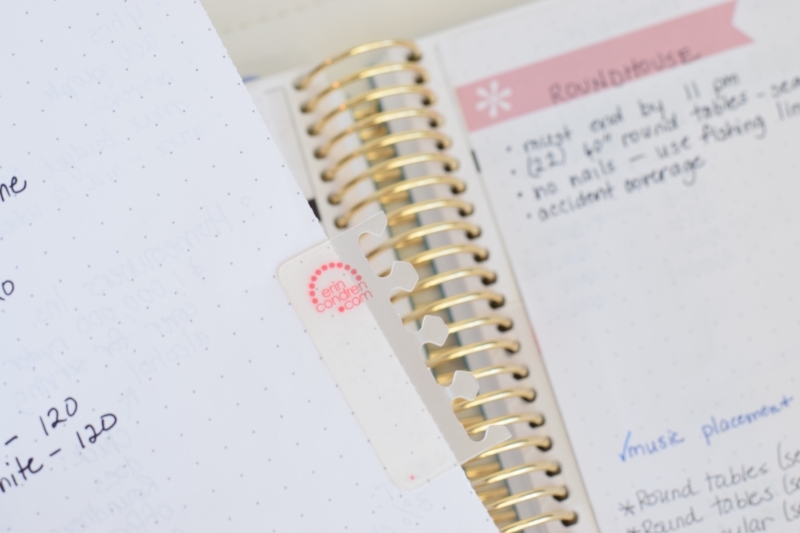 Favorite features of my weekly planner: the weekly sidebar that allows me to list those goals I think are most important for a week, and being able to see my entire week open and in front of me on my desk. And…the coil clip accessories that Erin Condren offers – I clip in so many things! Appointment cards, wedding shower invitations, time sensitive coupons! 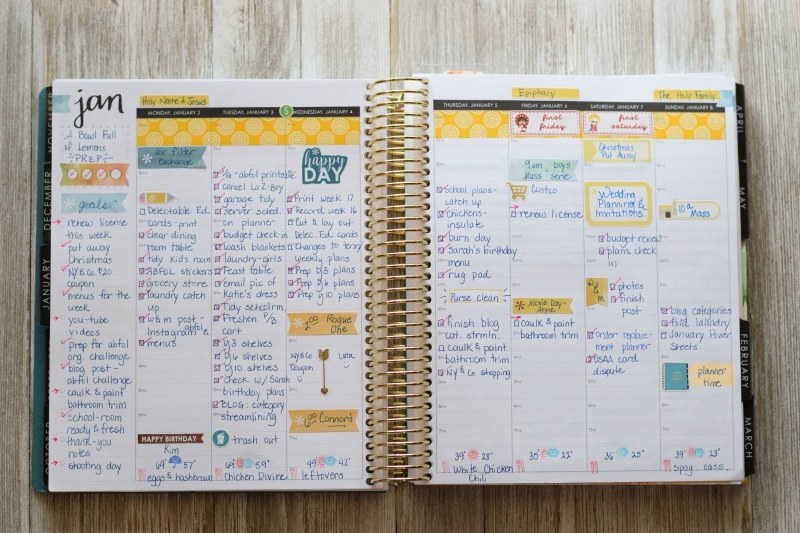 A quick note: Emily Ley makes a weekly version of her planner that looks beautiful! When you can no longer manage your tasks and lists and goals with a weekly overview and spread, then you may have graduated to a daily planner. And this, friends, is where I am. I need a full page to fit it all. My daily schedule and appointments fit, my goals and to-do lists fit as well. And I still have room for menus and random notes…because it seems like there’s always something random popping up that fits on my planner…I’m not sure why that is, but I like that there’s a spot for it to land. And I love that I still have room to fit my health goals, my high schooler’s work schedule, wedding planning appointments, church volunteer work, menu plans – I can fit and manage it all! It all has a place to land, and right now, with so many details and decisions and places and events – I need a place for it to land or all these plates I’ve got spinning are going to start falling! The design is minimal on purpose, and frankly, I need that. I don’t need any more noise – I’ve got plenty of that coming from the kitchen and bubbling down the stairs. I need my planner to be a quieter tool. One that prompts me in the right places, gives me actionable points when I need a road map, and has enough space that I can see margin in my day. 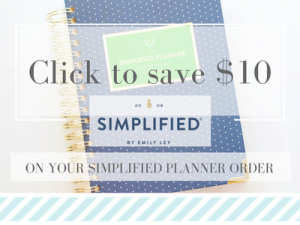 The Simplified Planner fits those needs for me right now. 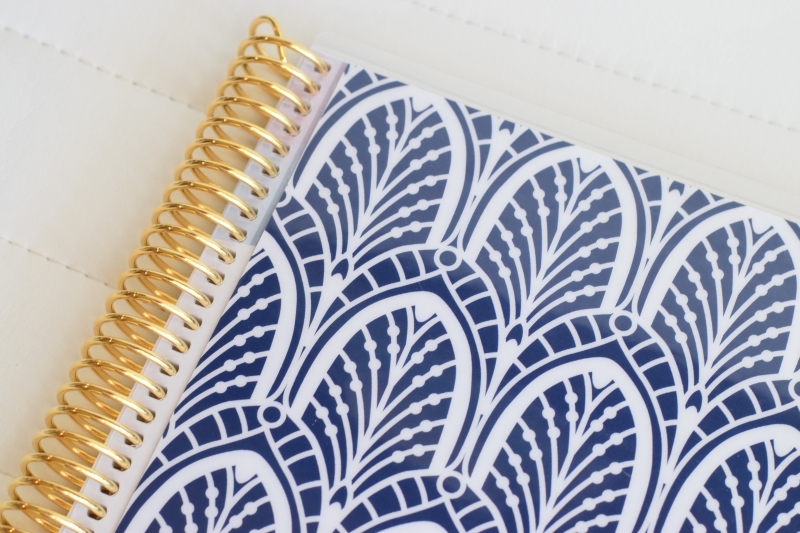 If you’ve got actionable items each day and need adequate space to jot appointments, goals, and still want room for the little things that pop into your day on an hour-by-hour basis, a daily planner might be for you. 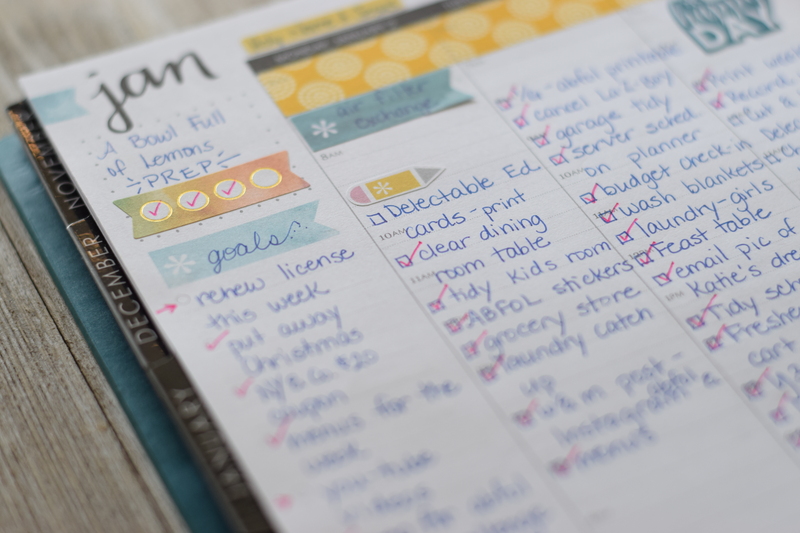 The Emily Ley Simplified Planner is one I love, but my good friend Dawn uses a Day Designer Daily Planner and loves it! (I may pick one up and take a look at it since they’re so affordable – if I do, I’ll snap some pics and share with you!) You’ll love reading Dawn’s planning posts if you haven’t discovered them yet! What Planners Do I Use? 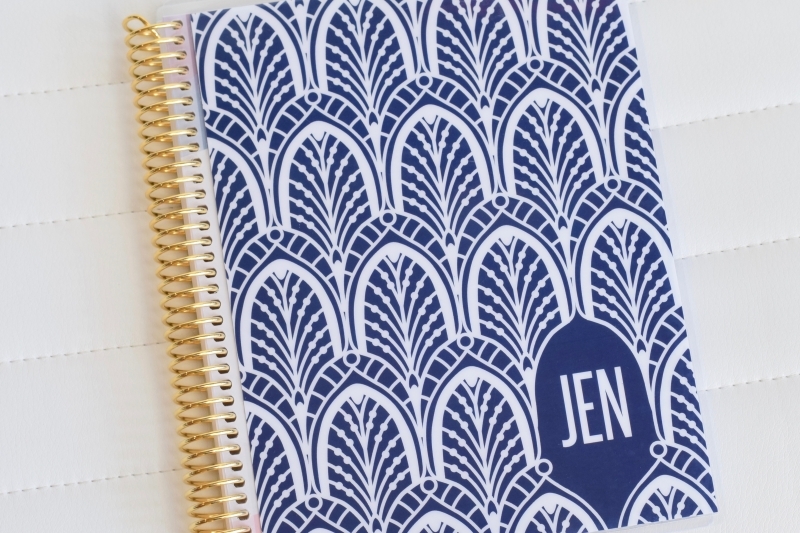 For my life and all the things – an Emily Ley Simplified Planner (Daily) . Because I need the space of a daily planner. 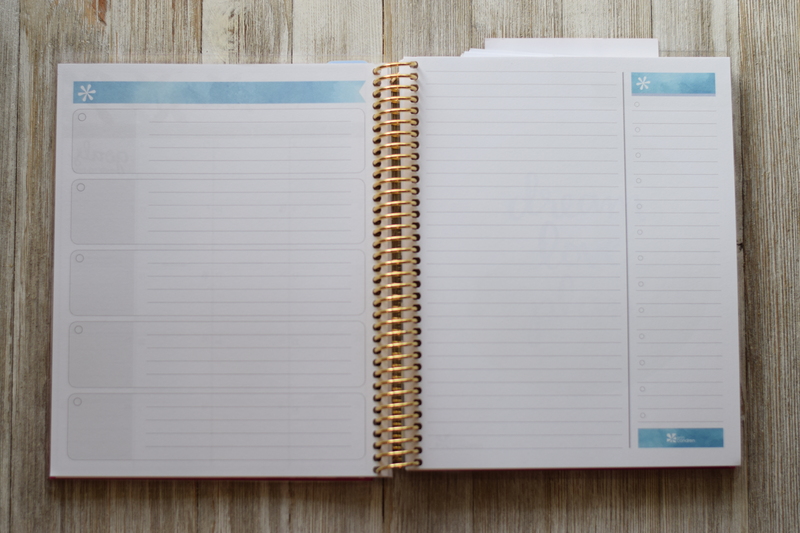 For school administrivia and Morning Basket plans and recording – an Erin Condren Life Planner in the horizontal layout (I’ll share more details and photos of that soon!) 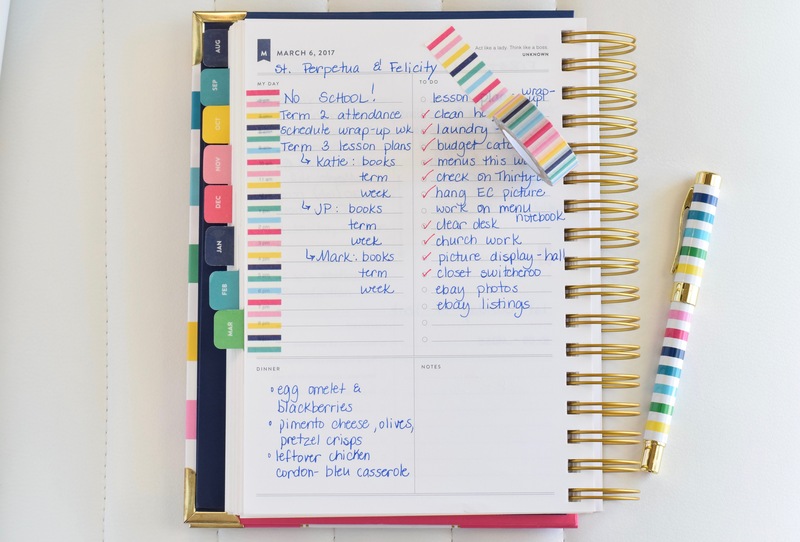 The size and layout of this planner works perfectly for managing attendance, volunteer hours, grades, books we’re reading aloud, and our Morning Basket details. 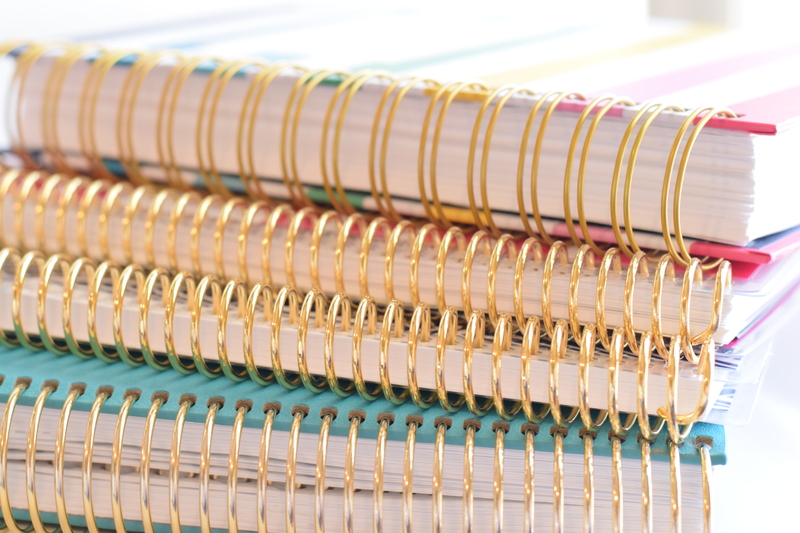 For ideas, quotes, note-taking, lists, and ideas that need to live on paper – an Erin Condren Coiled Notebook (actually…several of these! I love them!) Pictured below. And in my purse – portable perfection! 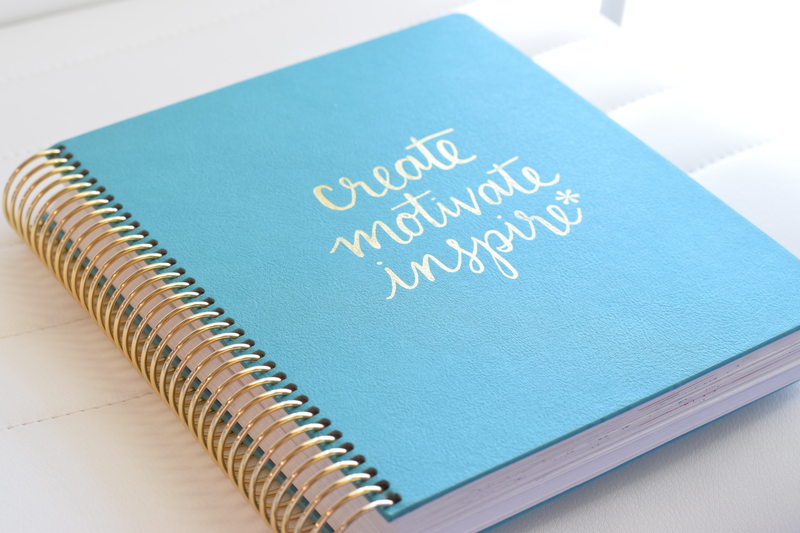 An Erin Condren Hardbound Notebook! (pictured below) The cover has a velvety feel and it’s the perfect notebook for sliding in and out of your bag. If there’s a note or an event that I need to jot down on the go, I drop it in here, and then add it to my planner later! The fullest days are just ordinary days that ask us to be present and do the next thing, love the people in front of us, and live out our vocation joyfully. Some of the links provided in this post are affiliate links. They cost you nothing, but I may make a little money if you decide to click through and purchase. Thank you – I’m grateful!! My favorite affiliate link is this one – Erin Condren first customer coupon – because it’s a coupon for you! 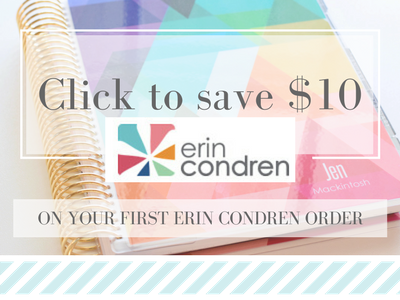 If you’re a new Erin Condren customer and click through using that link, you’ll save $10 on your first order! Thank you for this! I love the beauty and simplicity of your planning. One question, though. I also love paper planning, but how do you manage to only carry a notebook along when you are out? If you need to make an appointment, or clarify a date when you are out, do you have it all “in your head”, or do you also keep a digital calendar​? 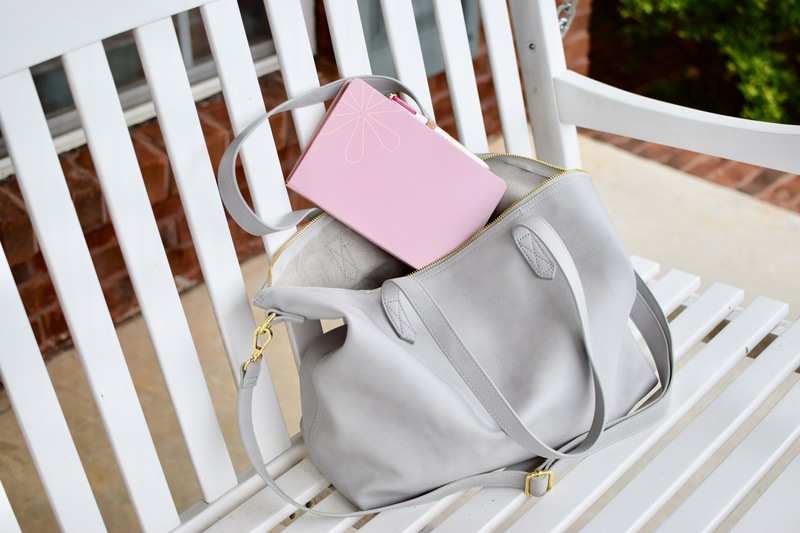 This is the detail that keeps me from going 100% paper… The weight in my purse and the possible need to keep track twice as much (both paper and electronic) in order to not carry the weight. Thanks for your insight! God bless you and your family. I apologize for taking so long to respond to your thoughtful question! I keep a small notebook that also has a mini calendar of appointments-only listed. That’s how I can make other appts, etc, when I’m out without my planner. Sometimes I do actually bring my planner along with me if I know I’m going to be doing scheduling that day, but usually I do just fine with my little purse notebook. Next year, I’m considering a purse-size planner. When I do my monthly planning at the beginning of each month, I take out my purse agenda and make sure I’ve merged both calendars. It doesn’t take long to do this. You are the one who got me into EC Planners and this year I switched to the Simplified Planner and just *adore* the layout. It is the best fit for me. Now, let’s talk washi and stickers, girlfriend! Where did you get the following cuties? The Check off sticker below A Bowl Full of Lemons. 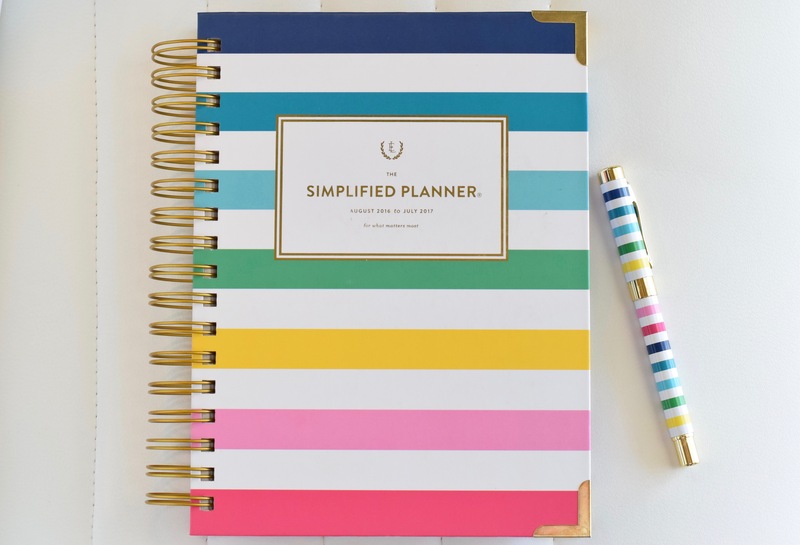 Always love the planner/office bling you show 😉 How have you all been doing? Miss seeing you more often and hope you are all well. Blessings for a beautiful Easter too! Ann-Marie!!! Time got away from me here…and I’ve been longing to get to your question and answer it! 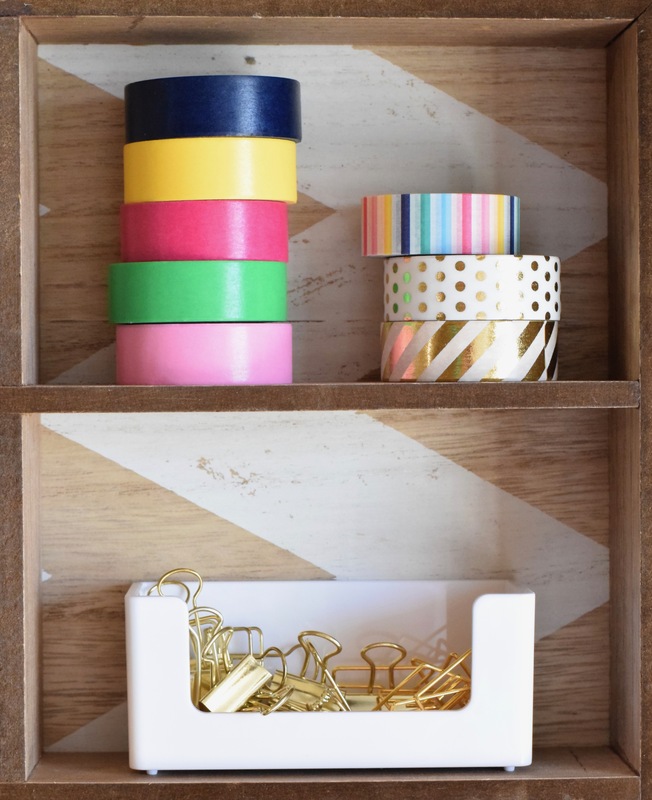 A girl after my own heart – let’s talk washi and stickers! The washi came from Michael’s – it’s in a set of 5 or so washi in one of those tubes. It’s an EXACT match to the EL happy stripes. I just love it! The First Friday and First Saturday stickers come from a favorite etsy shop – Blue Scooter Press. The gold clips….I can’t remember. Either Hobby Lobby or Amazon. But probably Hobby Lobby. The check off sticker came from an Erin Condren sticker book. I think it’s meant to run vertically on a page, but I use them horizontally all the time! The academic version of the ELSP cover reveal is May 10, and the launch day is May 17. 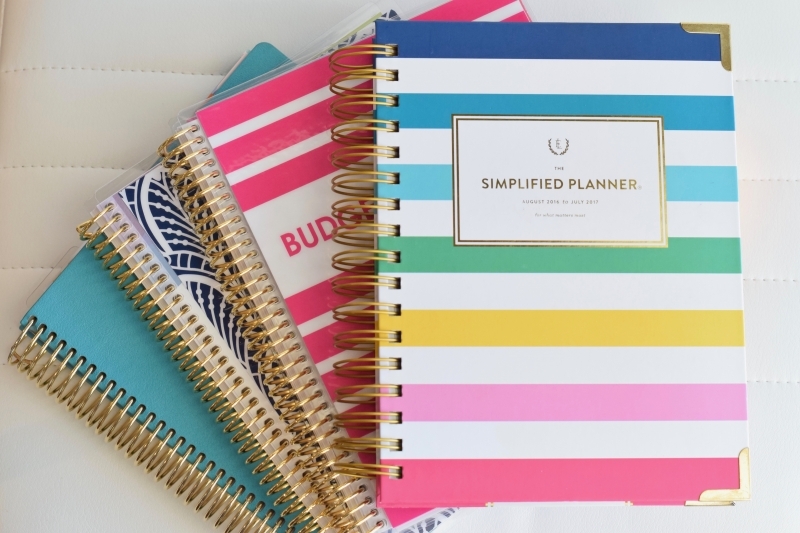 The Simplified Planners recently came on my radar, too, for similar reasons. Nice to see a review with pictures of how you use it! I have been telling myself that I already put the money into the EC for this year, but I’m not sure it makes sense to keep trying to squish everything in.